Loutraki, the city where the ultra-modern and historic Loutraki Thermal Spa is located, is the cradle of the Hellenic Thermalism and the most ancient spa resort in Greece. In modern times the city began operating as an organized Thermalism destination since 1914 but the timeline starts at 1847, the year when Prof. Giovani Batista Delviniotis performed the first measurements on the metallic waters derived from the natural springs. In 1855 the first wooden bathing facilities are constructed featuring 10 bathtubs, while in 1874 those were replaced by stone built ones. In 1934 the classical building of extraordinary architecture of the Luxury Baths was raised and was often visited amongst others by the Prime Minister of Greece, Eleftherios Venizelos, for therapeutic purposes. 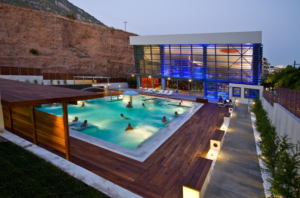 This classical building was renovated on 2009-2010 and was connected in a harmonious way with the ultra-modern facilities of the new venue, now named “LOUTRAKI THERMAL SPA”.